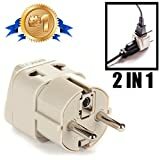 The electrical receptacles used in Romania are type F. You will therefore need a US to type C/F adapter in order to plug in your appliances. Special considerations - Virtually identical to German standards. 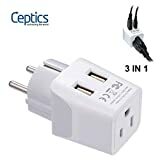 Most household sockets still compatible with East European standards (4.0 mm pins). Industrial appliances (washing machines, welding equipment) use 3-phase 400V AC supply.